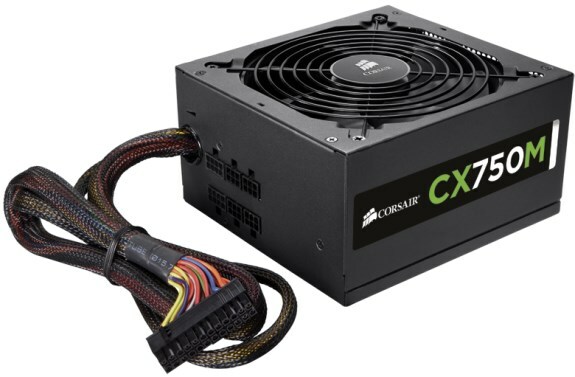 Corsair shows off the CX, a new line of modular power supplies with 80Plus Bronze certification. Available in 430W, 500W, 600W and 750W versions, these units have a MSRP of $59.99, $79.99, $84.99 and $99.99, respectively. Corsair®, a worldwide designer and supplier of high-performance components to the PC hardware market, today announced the addition of the CX Series Modular™ power supply units (PSUs) to the company’s award-winning PSU line-up. Available in 430, 500, 600, and 750 watt power configurations, the new CX Modular PSUs provide PC builders with the stable reliability of Corsair PSUs at a price that is easy on the pocket. Unlike budget PSUs, the CX Series Modular PSUs feature a hybrid modular cable system that allows PC builders to install just the cables (PCI-E, SATA, and 4-pin) required for their computer's configuration, for a cleaner look and improved airflow and cooling. The standard ATX form factor and ample cable lengths of the PSUs provide worry-free compatibility with the majority of PCs. In addition, the 80 PLUS® Bronze certified PSUs deliver up to 85% energy efficiency at typical 50% usage loads, producing less heat, improving reliability, and reducing noise. “Corsair CX Series PSUs have an unrivalled reputation for reliability, which has made them the clear choice for value-conscious PC builders,” said Thi La, Senior VP and GM of Memory and Enthusiast Component Products at Corsair. "We designed the new CX Series Modular in response to customer requests for a modular PSU at lower price points. They are built to the same high level of quality as our Corsair CX Series, with new configurable cables that simplify installation and help PCs stay cool and uncluttered."